Clearly, we are always on the lookout for a great keyboard to sport on our Android devices. And with so many to choose from, it’s easy for some to fall through the cracks. During CES, we were introduced to Adaptxt, a keyboard that isn’t new by any means, but offers some great features that are lacking in many of the bigger names in the game. For example, themes are something that need to be implemented and focused on. Sure, you can swipe and all of that fancy stuff, but if the keyboard is ugly, I’ll pass. 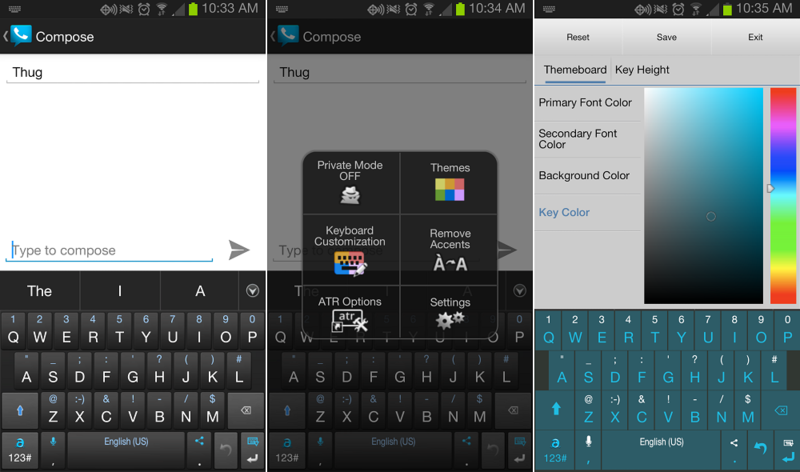 Adaptxt features a real-time customization tool, allowing users to make their keyboard look however you choose, as well as pre-defined themes. On top of that, the quick word prediction is spot on for speed texters like myself. And for our international crowd, it supports a total of 103 languages, which is quite the impressive number compared to competitors. I do enjoy swiping, but if I have to correct the keyboard every other word, it begins to be more of a hassle than a convenience. What’s the one thing that keeps you with your keyboard of choice? Accuracy? Looks?